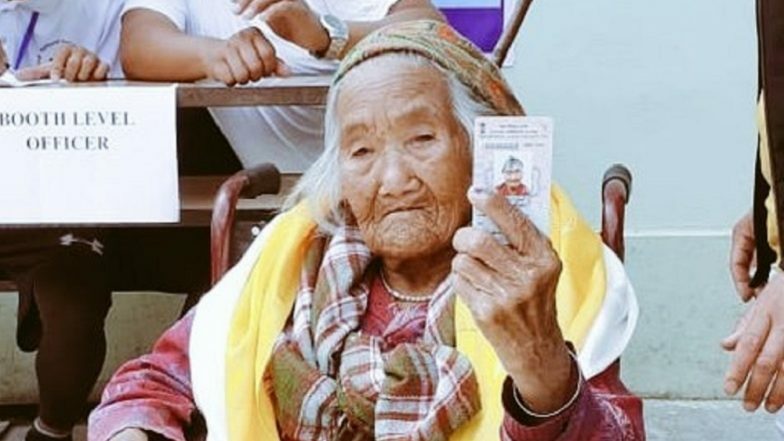 Gangtok, April 11: Sumitra Rai, a 107-year-old woman, on Thursday became Sikkim's oldest registered voter to exercise franchise in the Lok Sabha elections. She came on a wheelchair to the Kamrang Government Secondary School polling booth in the Poklok Kamrang constituency to cast her vote. Her photographs were shared by the official Twitter account of the Sikkim office of Press Information Bureau (PIB), the publicity arm of the Ministry of Information and Broadcasting. A man aged over 100 years also cast his vote in the Mokokchung district of Nagaland, as per the social media account of the Chief Electoral Officer, Nagaland. Andaman and Nicobar Lok Sabha Elections 2019: Phase I Voting Ends for Andaman and Nicobar Parliamentary Constituency, 61% Voter Turnout Recorded. Senior citizens stepped out in different parts of the country to exercise their franchise in the first phase of polling held in 91 Lok Sabha constituencies across 20 states and Union Territories. In Gaya, CRPF personnel extended a helping hand to the aged voters, while in Nagpur, senior citizens led the way by their inspiring participation.